Dr. Pala looks on as students collaborate during a simulated drill. When disasters strike, it’s important to be prepared. Responses can hinge on the ability of skilled, agile GIS teams to swiftly map and communicate the locations of impacts, for decision-makers and emergency personnel. But how do GIS teams gain crucial mapping skills and best learn to perform important tasks under pressure? 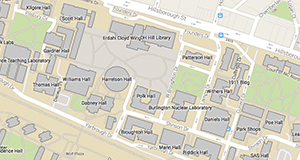 At the Center for Geospatial Analytics, one educational approach now uses realistic drills. Last summer, center research associate Dr. Okan Pala began developing a new graduate-level course to train students in the fundamental principles, spatial analyses, data sources, and bureaucratic structures critical to disaster management. To make the course truly innovative, he applied for and won an Exploratory Grant from DELTA, Distance Education and Learning Technology Applications at NC State. The grant provided him with $8,000 and DELTA staff support both to create an educational disaster drill and to study it as a teaching tool. Cathi Dunnagan, a lead instructional designer with DELTA’s Instructional Innovation Services and her colleagues, David Tredwell, Kendre McKnulty, and Laurie Gyalog, worked closely with Okan to design and carry out the drill. Disaster drills are used regularly in professional settings, but this would be the first exploratory study of drills in an educational setting for GIS students, and the team found the concept very exciting. “Immersing students in a real-world scenario gives them the opportunity to apply the knowledge they’ve learned during the semester,” Cathi explains. Okan and Cathi planned the drill to simulate repercussions of a hurricane, intending to use data and media clips from a historical event. But Hurricane Matthew made landfall in North Carolina just three days before the mid-term was scheduled to take place. Seeing the opportunity to connect students with a disaster that had just touched their lives, Okan and his graduate student assistant, Paul Schrum, quickly gathered storm track data from NOAA, other information, and news media video clips and articles. When the students came to class on exam day, “Believe me, they were surprised,” Okan says. He instructed the students to imagine that they were now several days in the past, that an Emergency Operations Center in Florida had been evacuated as Hurricane Matthew approached the US, and that the students were now needed to fill in as remote support for the relocated center. He and Cathi decided to situate the simulation in Florida, given that students might have already been exposed to North Carolina data. During the drill, students created this evacuation map showing shelter locations in southern Florida and published it on ArcGIS Online. Over the next three hours, Okan presented students with surveys, quizzes, and several scenarios–­–starting with Hurricane Matthew’s projected track three days before landfall in Florida, followed by one day before landfall. Okan himself played the role of a city official without GIS expertise who was in constant need of the latest results from their spatial analysis. He charged the students with identifying and predicting affected Florida counties, evacuation routes, shelter locations, damage estimates, and more. Okan continuously monitored their progress, applying pressure to begin a new task, such as calculate economic impacts, before previous tasks were completed, and he complicated tasks as they were underway by adding layers of complexity––common occurrences in real response situations. Roleplaying was an important part of the exercise, Okan recalls. He urged the students to realize that other people would be counting on them for their analyses. “Hey, we need this right now,” he might say. “The county commissioner just called. He wants this list right away because he has to send it to the fire chief.” Cathi attended the drill to observe. With each new task, “you could feel the tension building in the room,” she says. The students “were getting very nervous, just as if this were a real disaster.” The pressure was on. Comparing pre- and post-drill surveys, the team found that after the drill students “felt more ready to participate in an Emergency Operations Center as a team member,” Cathi says. “That’s what we had hoped would happen.” The students also valued communication as an aspect of disaster management more highly after the drill than before. “They found out what they didn’t know and that teamwork was critical,” she says. Okan and Cathi presented these findings at the NC GIS conference in Raleigh this past February. Going forward, Okan will work with the DELTA team to design a GIS disaster drill guide that can be used by other educators and practitioners, and they will run similar drills later this spring and when he offers the course for a second time this fall. It is important, the team says, that they pass on what they have learned and even keep experimenting to further improve the drill as a teaching tool. Okan’s course is open to students pursuing either the center’s professional master’s degree in Geospatial Information Science & Technology (MGIST) or graduate certificate in GIS. It is offered both on campus and online. Okan and his team plan to hold another drill with a different disaster scenario in the upcoming months. It will be open to students and non-students who have GIS or disaster management expertise. If you are interested in participating as a GIS analyst or disaster management decision-maker, please contact Okan Pala at opala@ncsu.edu for more information. The Center for Geospatial Analytics’ business services coordinator, Mary Hicks, has been honored for her exceptional customer service with a CNR Award for Excellence. Center for Geospatial Analytics researchers Bill Slocumb and Charlynne Smith, and students Joshua Randall and Mark Griffin, contributed to an NC State-led partnership that evaluated the needs, challenges and possible solutions to energy challenges facing low-income households.